Looking for the best dishes and street food to eat in Bangkok? The city’s food is mostly experienced on the streets. Bangkok’s vibrant street food scene will definitely satisfy your appetite, as you might want to eat up whatever the smiling vendors are ready to serve you. 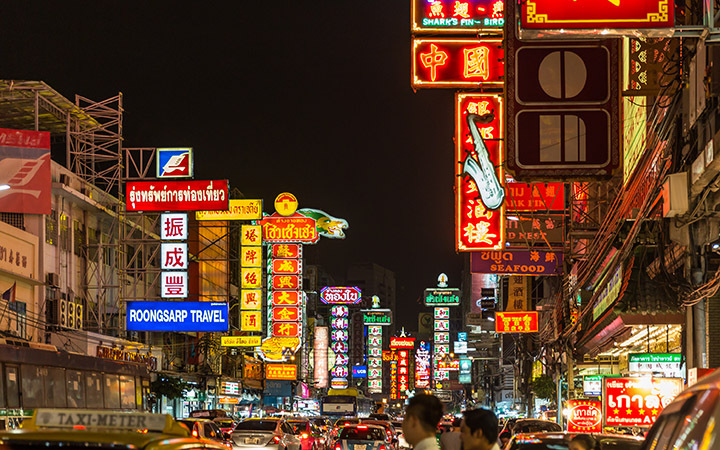 Bangkok is heaven for foodies, and probably the best city for food. It is everywhere, it is cheap, and it is AROY (delicious in Thai). If you're a Thai food fan, you are going to love what follows. There are so many foods to eat in Bangkok, including great Thai restaurants, that you can be easily be lost the moment it's your time to order. Even though the locals don’t eat as much Pad Thai as you’d think, you cannot leave Bangkok without having tried good Pad Thai. For the world out there it is to Thailand what bread is to France or what poutine is to Canada. This fried noodle, bean sprout, egg, tofu, and green onion wok-fry dish with shrimps, pork or chicken is like a national dish in Thailand, with a very interesting historical background. Try making it your own by adding any combination of lime juice, fish sauce, chilli, sugar, or peanuts! Wanna learn how to make a Pad Thai like a local? Go for a cooking class in Bangkok! Dig into the spicy dimension of Thai food with a bowl of green curry. This blend of coconut milk, fish sauce, bamboo shoots, chicken or beef, eggplant, coriander, cumin, ginger, Thai basil, lemongrass, lime leaves, and chili will tickle your palate. This hot and sour lemongrass and shrimps Thai soup will rock your taste buds! Dive into the flavors of lemongrass, galangal, kaffir lime leaves, fresh Thai chilies, and fresh lime juice. All together, those ingredients create the ultimate taste of Thailand. Som Tam is definitely a must that you need to experiment during your exploration of Bangkok’s street foods. This refreshing salad is the combination of sweet, sour, salty and spicy savours, where stripes of green papaya are tossed with palm sugar, garlic, lime juice, fish sauce and cherry tomatoes. Do not miss this refreshing and tasty salad, made with minced meat or fish, and seasoned with fish sauce, dried chili peppers, red and green onions and aromatic kaffir lime & spearmint leaves. If you're looking to try more of seafood & exquisite Thai dishes in Bangkok, check out the Top 10 Best Thai Restaurants in Bangkok. This might be one of the most common and popular Thai foods you can find in Bangkok. Minced chicken is seasoned with the flavours of Thai basil, fish sauce, chilies and garlic. It is served with rice, fried egg and chilli sauce. If you ever come across those little brown pancakes, you should definitely give them a try! They are made from sliced coconut and they are delicious! For the love of all sweet things, you cannot miss this simple but delicious dessert. See those stalls with mango pyramids? Stop here and try this combination of sweet and juicy mangos with sticky flavoured rice and coconut cream. Heaven! You can find in Bangkok an impressive variety of fresh fruits in street food stalls, from the most familiar like pineapple or watermelon to more exotic ones. Treat yourself with exotic fruits that you can find everywhere in the city. Mango. One of Bangkok’s nicknames is The Big Mango and you can easily understand why when you visit the city. Thai mangos are incredible: they have a pale yellow skin and a non-fibrous flesh that is so sweet, juicy, and smooth. Durian. You love it or you hate it. Durian is very famous for its strong and unpleasant smell. Once you open the big, spicky ball, you can try by yourself the soft, creamy texture and tropical flavour of its yellow flesh. Dragon fruit. The funny look of this fruit with its pink colour skin reveals a white soft flesh with little black seeds inside that looks like a kiwi. Mangosteen. It is a strange-looking fruit with its purple shell that you need to press to open and taste its delicious white flesh. The taste of this curious fruit might remind you of the one of a sweetened rhubarb. A little thirsty during your perfect meal hunt? Try those delicious and refreshing drinks. Coconut Water. If you only know coconut water from cartons you can buy in supermarkets, you should try natural fresh coconut water. Street vendors either put it in a cup or give you directly the actual coconut cut at the top that you can drink directly from with a straw. The second option is better since it also allows you to enjoy the coconut flesh inside with the spoon provided to you. Pomegranate juice. Try this blood red and sweet freshly pressed pomegranate juice that is just so good and refreshing. You can basically find food on every street corner from small street stalls. Areas full of locals are good signs you might catch great street food. Here are the best spots for street food in Bangkok. Careful, however: Mondays are street cleaning days in Bangkok and some food stalls vendors take the day off. 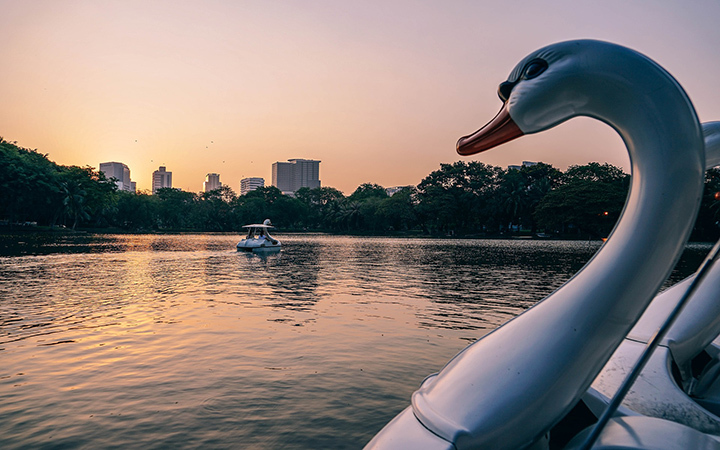 Just off Lumphini Park, camped on the northwest corner, along Ratchadamri Road, you will find a collection of street food vendors. Walk by the stalls, choose what you want, pull up a chair and enjoy! Getting there: Take the MRT Subway to Silom station, Exit 2. For authentic street food, Chinatown, also known in Thai as Yaowarat, will leave you in the capable hands of hundreds of street food vendors. The competition is fierce between the food stalls, meaning that only the best vendors can survive, which makes Bangkok’s Chinatown one of the best place for street food. Get lost in the streets and go wherever the delicious smells take you. Getting there: Take the MRT Subway to Hua Lamphong station, and it is just a 15 min walk away. Chinatown doesn't just have great street food but it also is a fun place to shop. 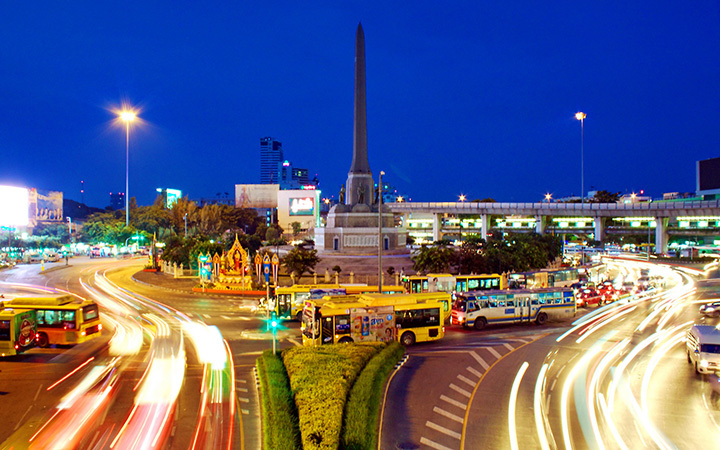 Check out other Fun Things To Do in Bangkok. As one of the main transportation hubs in the city that makes the area very crowded, Victory Monument is a great place for street food. You will have a large choice from a lot of street stalls that abound in the streets. Evenings are better to come to visit the area. Getting there: Take the BTS Skytrain to Victory Monument station, Exit 3 or 4. We hope you've enjoyed discovering what to eat on your journey to Bangkok! With this guide you're sure to experience the best of Thai cuisine. The best Crab Fried Rice (ข้าวผัดปู) in Bangkok in 2018 as ranked by local foodies.